One of the largest forests in the United States, Tonto National Forest, is located just north of Phoenix, Arizona. The forest itself was made a national park during an economic boom after the Roosevelt Dam was completed. Because the dam is necessary for ensuring Phoenix’s water supply, Tonto became federally protected land to protect the watersheds of the Salt and Verde Rivers. It still performs this function today. This popular hiking destination spans approximately 2.8 million acres and is visited by about 6 million people annually. There are two main reasons why Tonto National Forest draws in so many visitors each year. First, it is unique in that it is one of the only places in the world where six separate ecosystems exist within the same forest. The environmental variety of the American Southwest is fairly represented by variety of vegetation and range in altitude from the desert floor to the mountain peaks marks that are found in Tonto. Over 63 species of reptiles and lizards, 92 species of mammals and 50 species of fish call Tonto National Forest their home. Birdwatchers will be thrilled to know that over 388 diverse species of birds occupy the forest year round. The other attraction of Tonto National Forest is the ancient ruins of the Hohokam people, a group of accomplished farmers, craftsmen, traders and warriors that lived in the area prior abandoning it 600 years ago. The biggest accomplishment of the Hohokam was their introduction of hundreds of miles of irrigation canals to the region. Their dwellings and carvings, known as petroglyphs, are all that remain of this ancient tribe. The ruins of Hohokam have fascinated Arizona historians for years, as it appears that these ancient people left their homes in a hurry, leaving everything behind. Most people guess that a long period of droughts, conflict and floods caused the Hohokam to leave, but nobody knows for sure. Hikes through the area today usually range in length. Some trails, such as the Petroglyph trails, only take a few hours. Others, like the hike from Cave Creek to Seven Springs, can take up to two days. Many hikers choose to hike from the early evening until after dark due to the abundance of wildlife in the area. Most of the creatures in the Sonoran Desert are nocturnal, so the best chance to see them is at night. 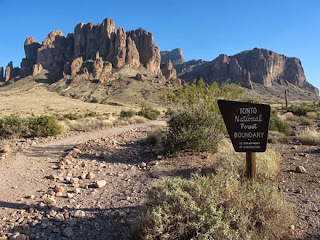 Permits are required to hike in Tonto National Forest. There is a $3 conservation fee, and the price of permits varies based on the different conservation areas of the forest. The most common permit used in the area is the Tonto Pass, a $6/vehicle pass that is valid for 24 hours. Most of the companies that offer guided hikes in the area build the price of the permit and conservation fee into the cost of the guided hike, so those who choose to hike with a guide may not have to worry about obtaining an individual permit. Camping, hiking, horseback riding, biking and backpacking are all permitted in Tonto provided those who do so are respectful to the land and observe proper etiquette. As with most natural parks, littering and fireworks are prohibited and campfires may be restricted during dry seasons. For more information about Tonto National Forest or to purchase a permit, visit the USDA Forest Service website. The Tonta National Forest is beautiful place and a great area to go hiking and camping. Great information and a great site! Love my Tonto National Forest. Let's keep it clean and protected.